Porsche has set another new record on the Nürburgring-Nordschleife in cooperation with Manthey-Racing. On Thursday, 25 October 2018, the Porsche GT2 RS MR with 515 kW (700 hp) completed a lap of the 20.6-kilometre long circuit in 6:40.3 minutes. No other road-legal vehicle has ever been so fast on ‘The Green Hell’ track. Lars Kern was at the wheel of the sports car, which had been especially set up for the ‘Nordschleife’ by Porsche engineers and Manthey-Racing experts. The Porsche test driver already set a lap record in September 2017 in a series-production Porsche 911 GT2 RS*. The Porsche GT2 RS was launched on the market in 2017 as the fastest and most powerful 911 of all time so far. In recent months, Porsche engineers used their know- how from development of the 911 RSR and 911 GT3 R race cars as well as the experience of Manthey-Racing gained in numerous successful races on the Nürburgring-Nordschleife. The targeted modifications included the areas of chassis and aerodynamics. The technicians focused on suitability for on-road driving at all times. In autumnal but dry conditions, Lars Kern optimally exploited the huge potential of the Porsche 911 GT2 RS MR on his record lap under the eyes of a notary. For the fuel, Porsche relied on Esso as a proven partner from motor sports. 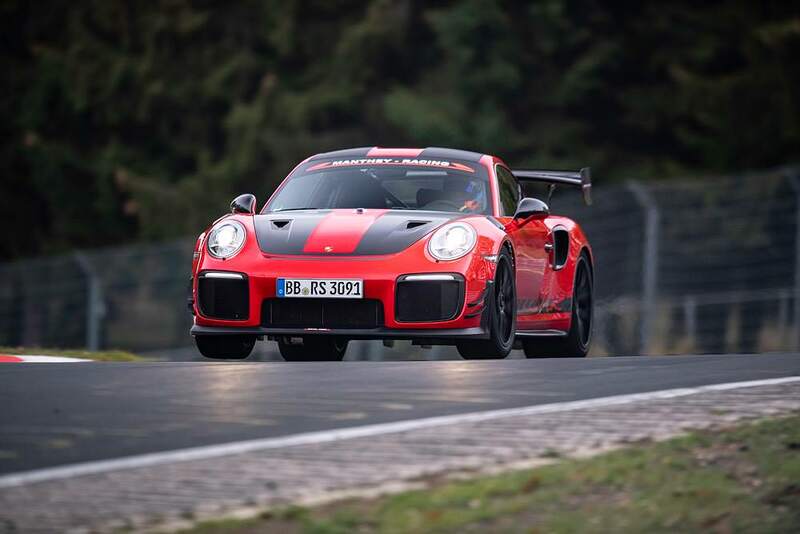 The driver’s seat was the only modification compared with the version of the GT2 RS MR that can now be ordered from Manthey-Racing for club sport and track day events. A racing bucket seat was fitted in the record-breaking vehicle for safety reasons. This modification did not provide any weight benefits.